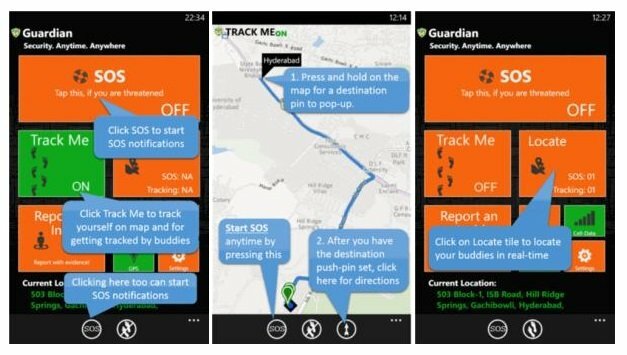 Microsoft India has recently launched Gaurdian, an application available exclusively for Windows Phone users, aiming at women’s safety in India. This app was developed over six months by group of enthusiastic working at Microsoft India. Guardian, a security app comes handy especially when someone is in trouble. Using its “Track Me”, now it has become easier to track your friends and security services in the state of emergency. Very useful and “Free” to install app one the Windows Phone store, Guradian is receiving combinational feedback from its users. According to some users, it works nicely and its ability to bombard messages to your beloved ones for help makes it easy to grab their attention. However, it seems Lumia 520 users are facing some issues using this app. According to them, once Microsoft account is connected, it further fails to connect with guardian server. We hope this will be resolved in the next update release. Talking about the features it offers, this app will let your phone to send out a distress SMS to all the contacts in your phone. It will notify them of the emergency along with location details. At the same time, the SOS button will send out emails to your friend’s email IDs and posts to private Facebook groups, if registered. – Click here to download Guardian for Windows Phone.